Winter sport Zell am See! Zell am See and Kaprun in the Salzburg province of Austria. Many years we have been skiing and snowboarding here since the area is great, often the snow conditions are good until April, the apres-ski is awesome and we have got friends that work here as ski & snowboard instructors. The fresh water lake, Lake Zell, and the surrounded charming chalets makes the snowy mountain area picturesque. The chalets are very clean, everything is well organized and the Austrian hospitality is amazing! Zell am See and Kaprun offer 138 km of ski slopes. The three main mountains areas are Schmittenhöhe, Kitzsteinhorn and Maiskogel. Zell am See town lays at 760 m, the peaks are Schmittenhöhe at 1956 m, Kitzsteinhorn at 3203 m (impressive elevation from town!) and Maiskogel at 1730 m.
Typical Austrian apres-ski parties on the slopes that finish after dark with loud music, big beers and shots (schnapps). In town there are many bars and restaurants for every budget, you can easily go in your ski outfit. There are many places to rent ski equipment as well, search around for some good prices or book online. We made the mistake of just walking-in to rent our gear at the Intersport at the base station City XPress on a Saturday morning (changeover day). The price was high and the queue was long, we waited for 1,5 hour. The Kitzsteinhorn (3203 m) in Kaprun is a glacier, the area has less trees and offers amazingly wide slopes. 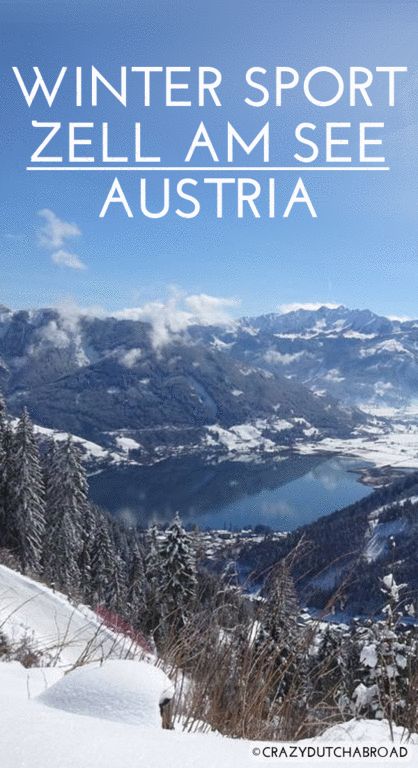 Because the ski area is at a greater height than Zell am See and more 'in the open' it is better to go skiing here when the weather conditions are good. This year we went here right in some sort of snow storm with heavy wind so we ended up staying in the 'ice bar' for a while, which is an experience by itself. This huge ice bar / iglo at Ice Camp has colorful lights and warm bearskins, they even offer shot in ice glasses! Zell am See and Kaprun are not connected but with your ski pass you get a free bus ride. Every time I am in this area I spend most of my the time in Zell am See to learn more about snowboarding and have fun with apres-ski. There are more trees and flat paths around Zell am See which are great to make spectacular tours with beautiful scenic views, especially after it has been snowing. Zell am See slopes and view over the lake. We were so lucky having a lot of fresh snow in the beginning of March! Time to go powder hunting off-piste! There are many wooden Alpine huts and Austrian mountain restaurants on the slope, it is amazing. Schnapshansbar is one of my favorites with a huge panoramic terrace. Waiters wear lederhosen (leather breeches) and dirndls (white blouse and dress with laces & ribbons) and the beers go by the liter. Schapps shots are often filled with a piece of fruit or a nut (love this one!) around here. They can be a great party maker and you often get a free round if you give enough tip. In general the service is very fast and friendly. The Cabrio bar is great for apres-ski and meeting everybody. It is at the base station of City XPress and sometimes people literally ski-in the terrace. Zell am See town has something for everybody and for every budget. From high-end luxury dining to clubbing party scenes and everything in between. The Dorfschenke is a great place to continue your apres-ski and get your hips moving on the pumping music and sing-a-long favorites of the past decades. It is at walking distance from the Cabrio bar. Villa Crazy Daisy in the middle of town has a cozy place outside with bearskins and heaters, for dinner - reservations are highly recommended. Ebenbergalm is an Alpin hut, still on the slope but really close to base station (City XPress). Apartment Haus Sonnenheim is an authentic chalet with a great view over the lake and fresh bread rolls every morning!